Unfortunately we do not currently have any accommodation on offer for the island of Nissyros. You might want to consider looking at the other Dodecanese islands. Nissyros or Nissiros or Nisyros is part of the Dodecanese group of Greek islands situated between Kos and Tilos, in the Aegean Sea. The island of Nissyros is a volcanic island, featuring many craters, the largest of which, called Stefanos has a diameter of approximately 260 meters and 30 meters in depth. There are also many thermal springs to be found on the island, most near Mandraki town which is the capital of Nissyros island. The coastline of Nissyros is mainly rocky or pebbly and there also some sandy beaches to the North Eastern part of the island. 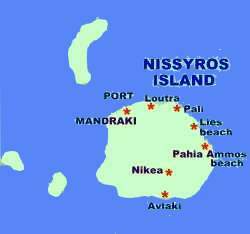 GETTING TO NISSYROS - The island of Nissyros can be reached by boat from Athens, Piraeus port and from Kos island.